Sekiro mods are already appearing on Nexus Mods only a few days after launch. Since Dark Souls, modders have put huge effort into polishing up From Software's games and adding extra features. Sekiro: Shadows Die Twice runs well on PC in our experience, but there's always room for improvement. Get faster framerates, adjust the FOV for wide displays, or change the colour of Sekiro's outfit. Word of warning. As always, mods that mess with game files put your savegames etc at risk. Be sure to back up your save before messing around with anything. You can find the save files at C:\Users\[username]\AppData\Roaming\Sekiro. Also make sure you switch the game off via the menu screen (don't recklessly Alt-F4), as this can cause save file corruption. Here's our roundup of the best Sekiro mods. Many mods rely on the Sekiro mod engine to work. It's a file editor that lets mods mess with the game's guts. It also skips the logos at the start of the game so you can get stabbing faster. Sekiro's framerate caps out at 60 fps, but with a bit of work you can get the game running much smoother than that. You need to unpack Sekiro.exe using Steamless and then apply this patch to the .exe for this to work. Its creator cautions that it "may cause bugs, so testing is needed". Framerate alterations to Dark Souls have had some odd knock-on effects. Dark Souls 2's weapon durability system went haywire. It was eventually fixed. If you have a really wide monitor you might want to adjust the FOV to give you a more sensible perspective. Like the framerate fix above, this mod also requires Steamless. The PC version of Sekiro has a hard time recognising Playstation 4 controllers. This is odd, because modders have found native PS4 buttons in the game's files, they just aren't activated. Fix that with the Native PS4 Buttons mod. Bored of the One-armed Wolf's brown and orange gear? Blend into the shadows with this simple but effective colour swap. Moonlight swords appear in Dark Souls 3 and Bloodborne, but it's not normally the sort of weapon a shinobi favours. This mod replaces Sekiro's sword with either the DS3 or Bloodborne moonlight sword. All of Sekiro's animations are designed for a smaller sword, but it's a fun novelty nod to From Software's history. Reshades change the saturation and colour balance of the image the game outputs, and sometimes add anti-aliasing and depth-of-field effects. Some reshades can be quite intense and over the top, but if you like more pronounced shadows and dark colours then the simple 'Sekiro HDR Preset' might do the trick. The Simple Realistic Reshade also gives the game's colours a big pop. 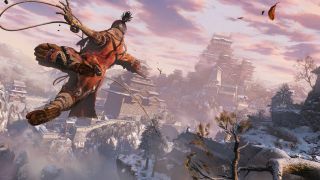 For more on Sekiro, check out our Sekiro: Shadows Die Twice review.